Not included: flights to/from the closest airport to the venue and travel insurance. Guests are responsible for purchasing travel medical insurance and cancellation insurance which are also not included. 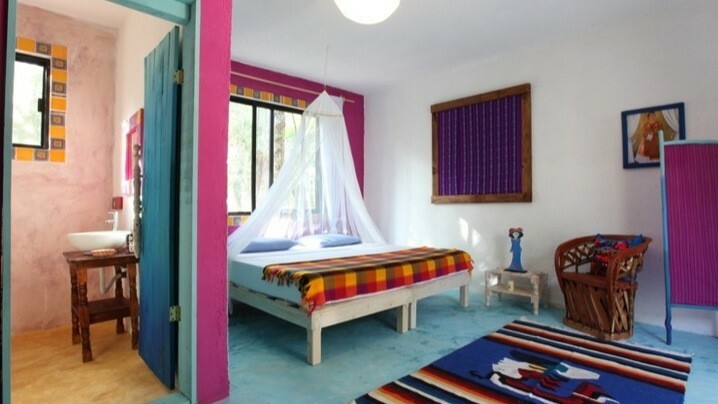 Fly into Cancun, private van service to the eco-lodge. Morning and evening yoga instruction, breakfast and dinner included. 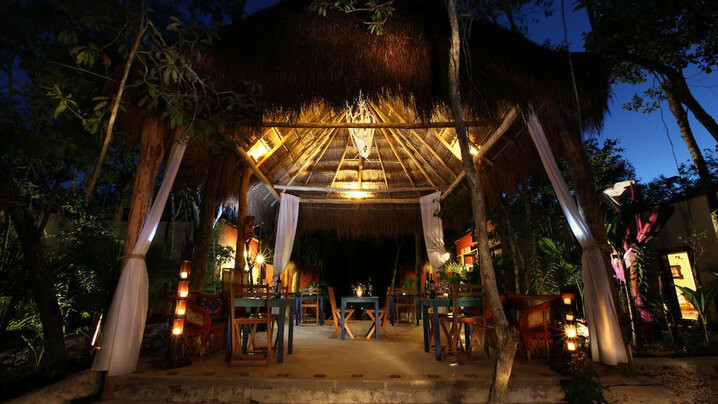 Choices of various activities in Tulum: beach, jungle tour, cenotes visit, diving. Private van service return to airport for departure. Pia is originally from The Bronx, New York. She was introduced to yoga over 15 years ago and was drawn to the safe space it allowed her to create. Pia teaches Vinyasa flow, Kundalini, Yin, and Recovery Yoga, and integrates postures, breath work, and meditation into all of her classes. She teaches in various studios in the LA area. An amazing way to see an incredible part of Spain! Well worth it and I'm so glad I did this. 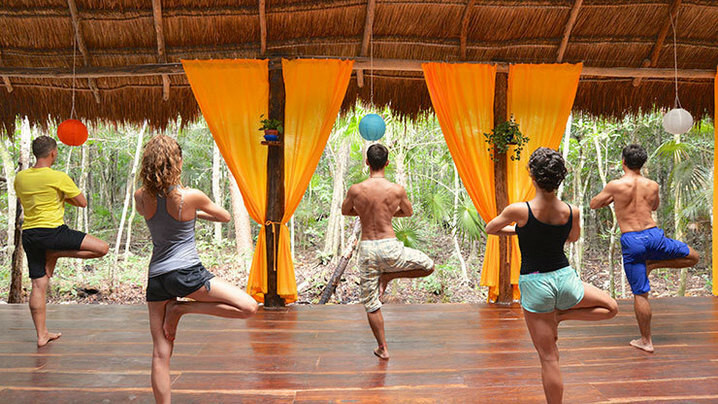 The YOGAqua SUP Yoga retreat to Tulum was amazing! Sarah was fantastic and we all had a lot of fun. I would definitely go again. The trip truly was awesome. I would agree with Michelle and say that I wish it was longer. I'm missing Playa Maderas, the surfing, the taco shop, and the good times with all the people from the group. I will definitely keep another Culinary Adventure to Nica on my radar. Thanks! Thanks so much for putting together the best trip ever. I've been all over and Nicaragua is the best by far. The warm water, great waves, beautiful scenery, diverse wildlife, and really cool people to share it all with made for a perfect recipe to take it all in. Sorry I ate all the food and I definitely lost count of my block intake. I can't wait until next time! Thanks again for the great food and great adventure, and thanks to all the culinary ninjas in the kitchen! The trip to Nica was just what Lewis and I needed… Meeting the amazing crew of people just solidified that sometimes you just need to connect with your "tribe" and all will become clear, and the world will right itself. From Flora, Bart, Marc & Marielle to the sweet ladies in the kitchen to the grounds crew -- the lovely people of BVSC made it a home away from home. Even the howler monkeys sang to us to show their love (thank god I brought ear plugs)! Yoga on the deck in the mornings just brought me such peace and renewal of spirit. Keeping it Paleo, soon in WA! Going on this adventure alone as a French-speaking Canadian girl was a challenge but I’m so glad I did go for it! I am amazed that i've been so lucky to be with this funny group of good, positive, life-loving and awesome people from all over !! I couldn't think about better people to live this trip with! Can't wait for the part II next year! This trip was life changing for me in the least cliche way. First of all, I met some of the most beautiful people… that I have ever come across. It was harder for me to say goodbye to this group than it is for me to say goodbye to some long time friends back home. I not only learned to cherish quality time with good people, but was able to do so while eating healthy, keeping up with my fitness, exploring Nicaragua, and learning tips and tricks in the kitchen... I now find myself yearning to travel, explore, and meet new people. Also, ever since this trip I am cooking almost every night! This trip was indeed priceless and I can hardly wait for next year. All the food was awesome. Moreno took us to great local restaurants that served great food. The meals were the 2nd best part of the trip and I'm not even Paleo! Had I known just how MUCH food there was going to be, I would have paid even more for this trip. Fantastic. I really had a delightful time. It just got better as the week went on. Moreno was a great guide - a wonderful sense of humor and great knowledge about the area. I loved the variety of food we got to sample and especially all the wine. We loved every minute of it. Thank you for a fabulous time! My favorite parts of the trip: Kim Smarr and the yoga classes, everything about Rancho Margot, beautiful surroundings, great human beings… I felt very cared for in every way. This trip was amazing! It was beyond all of my expectations. Harris and I were the random couple from Florida on this trip, but we never felt separate, out of place, or not a part of the group. Every single person on this trip was lovely and I really feel I have made new friends for life. There is no doubt that I would follow Kim Smarr and her group anywhere. She was simply wonderful and to be doing yoga twice a day in a rainforest paradise is every yogi's dream. I felt so connected, alive and spiritually recharged. This trip was so enjoyable I cannot say enough good things about Rancho Margot and Kim Smarr. I could not have asked for anything more... except time! I didn't want to leave! This was a great, great experience! Kayaking, waterfall hike and swimming, zip lining, yoga in the open air pavilion, the camaraderie of the group at meals, in the evening etc. Basically, I liked everything. Everything was fantastic! Loved being out in the wilderness just relaxing. Alex is awesome (but I did know that going in). And I found everything to be very well organized and planned out... I've already recommended you to all my yoga friends (teachers and practitioners both). The trip was phenomenal! … Everyone was so accommodating and great to us at the resorts; the food we were given daily was hands down the best and the living quarters we got were amazing; the excursions that were included and the excursions we paid for were, as expected, memorable and everything you'd want them to be. Join Pia's Tribe and stay up to date on their trip!